So You've Finished a Duolingo Tree, Now What? Aw, the sense of accomplishment. After months (or longer) of trying, you finally finish a learning tree on Duolingo. It's happened for me twice. A year ago I finished French, and just a couple months ago I finished German. German felt like the bigger accomplishment. I started German a few years ago on Duolingo, only to give up on it after a couple of months. Every now and then I would go back and try again, only to quit German again. In July of this year, I finally decided I needed to finish. It took me almost two months. (I was about a third done before July.) It was hard work. I had to tackle it a different way (more about this in a later post). Finally, the last Duolingo lesson in German was complete. But, according to Duolingo, I was only 56% fluent in German. I'm not sure how Duolingo comes up with that number. But it's probably close. Depending on the subject, I can understand about half of what I read and hear. Understanding only half of the German I encounter isn't going to be good enough. My two favorite channels on YouTube for learning German are Easy German and Learn German with Ania. Easy German isn't as easy as its name implies. Most of their videos consist of street interviews, with normal people they meet in public. The videos have subtitles in German and English at the same time. The videos are great for improving your listening skills, since the people in the videos are speaking at normal speed and using words that Germans actually use in everyday conversation. Easy German also has some videos categorized as Super Easy German. These are usually slower, and focus on either teaching vocabulary related to a certain subject (like using public transport in Berlin) or certain grammar principles. Learn German with Ania is a great channel for grasping grammar concepts better. Ania does a great job explaining different concepts, but she's just a little too enthusiastic for me, so I can only handle her videos in small doses. Another thing to check out on YouTube is Extr@ auf Deutsch. It's a simplified tv show for language learners. If you've finished the Duolingo learning tree, you'll understand most of it. (There are also Spanish and French versions as well. I watched a season of Voltron in German, and found a series of Bibi & Tina movies. I recommend watching things more than once. You can watch with the audio in your target language, and subtitles in English, and then on your second viewing have both the audio and subtitles in your target language. Sometimes the subtitles and the audio aren't the same, so be aware of that. Since I live in California, I don't have much opportunity to immerse myself in German. One thing I started doing was writing my grocery list in German. I did this in the past with Lao. One hint: depending on your level, you may want to not have all of your list in your target language. Struggling to remember what one or two items on your list means is one thing. Getting your dictionary (or Google Translate) out at the grocery store for almost every item is not so fun. Here's another hint. When looking at your list while at the store, try not to translate the items in your head. For example, last week I had Putenhackfleisch on my list. Instead of saying to myself "oh, that's ground turkey", I would try to have a mental picture of what a package of ground turkey looks like and where it's at in the store. It's amazing how quickly we can forget new things we've memorized. 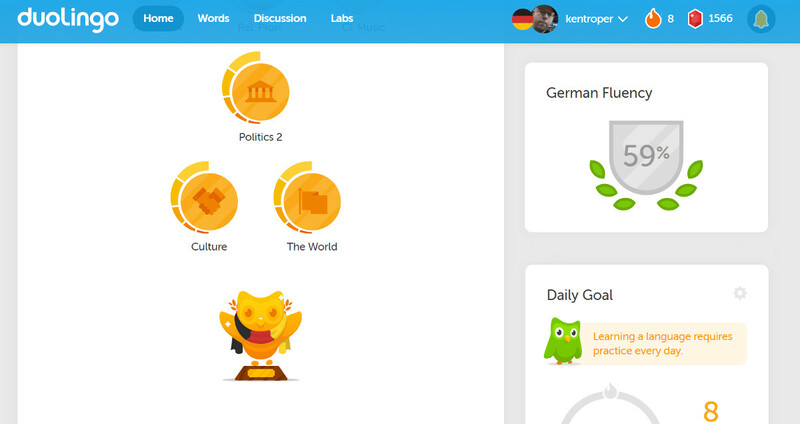 Even though I've finished the German tree on Duolingo, there's lots I've already forgotten. Though I'm not on Duolingo as intensely as I was when I was trying to finish the tree, I still try to get on every day to review. I miss a day or two, but I'm still fairly consistent. There are still grammar principles I'm shaky on, and lots of vocabulary that has disappeared from my memory. Another thing you can do after you've finished a Duolingo tree is to do the opposite tree, if it exists. For example, if you finish Spanish for English speakers, do the English for Spanish speakers. Have you finished a Duolingo tree? What did you do after that to continue your language learning? Also, follow my on Duolingo! I'll follow you back. You can find my profile here. Hey, are you ready for more polyglotkent.com goodness? Have a question or a comment? Add it here!